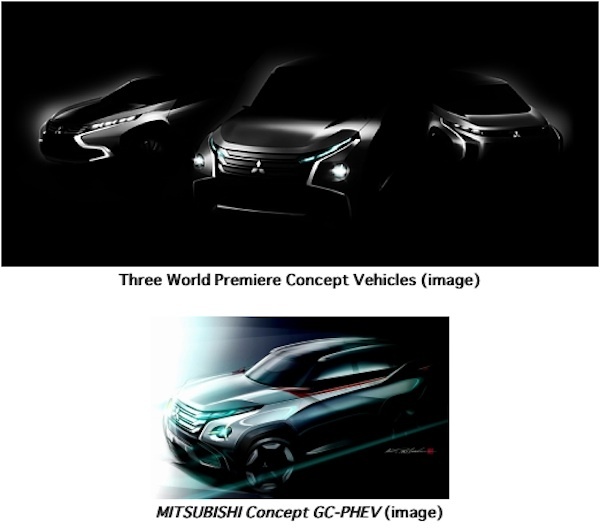 Mitsubishi Motors today said they will unveil three plug-in hybrid SUV's at the 43rd Tokyo Motor Show 2013. The three concept vehicles highlight Mitsubishi's @earth TECHNOLOGY while offering the security and functionality of an SUV. The MITSUBISHI Concept GC-PHEV (GC means Grand Cruiser) is a next-generation full-size SUV that uses a high output PHEV (plug-in hybrid electric vehicle) system. The idea is to give both the drive-ability of an SUV and great environmental performance. It uses the S-AWC (Super All Wheel Control) vehicle dynamic control system for superior handling, stability as well as the all-terrain capability. Mitsubishi also says it is a "connected car" with next-generation preventive safety technology and driver support technology through wireless connectivity. Mitsubishi's press release doesn't explain that further, but generally the "connected car" idea means data communications either between vehicles or between the vehicle and the road infrastructure. The wireless communication is for implementing autonomous driving capabilities which are hoped will make the roads safer for all of us. The MITSUBISHI Concept XR-PHEV* (X (cross) over Runner) is a next-generation compact SUV that stresses a light weight and enhanced environmental performance. The styling will be similar to a sport coupe. The MITSUBISHI Concept AR (Active Runabout) is a next-generation compact MPV (multi-purpose vehicle) that's supposed to both be nimble, like an SUV, but the occupant space of an MPV. Fuel efficiency technologies include a downsized direct-injection turbocharged engine. Other automakers have taken this path, such as Ford's EcoBoost engines that use turbocharging to let a small engine, at high fuel efficiency, produce the power of a large engine. Mitsubishi began selling a plug-in hybrid version of the Outlander, in Japan, in January. Reportedly it has been selling well despite battery problems that led to a production delay. The Outlander PHEV apparently won't make it to the US until 2015 because of battery supply issues constraining production, making Mitsubishi want to focus on delivering it in Japan and Europe first.